Costs – Keep your trees in top form for those hot summer months in Atlanta, Georgia. Learn about the average costs for tree trimming and removal, along with stump grinding and removal. FAQs – Do you know what the state tree of Georgia is? How about what the height of tallest and shortest trees are? More information on growing popular trees in Atlanta, rules and regulations associated with tree growing in the city, best fruit trees to grow, common tree diseases, and the best time of year to remove trees. Services – Peruse our list of tree maintenance experts for the one closest to your Atlanta backyard so you can get the job done right and quickly. How Much Do Tree Services Cost in Atlanta? Having trees on your property that need to be removed can be unsightly, but they can also be unsafe. Trees may put your home at risk, and they can even serve as fire hazards in certain climates like the hot summers of Atlanta. Here are some of the most common tree removal services needed as well as what you can expect to pay in and around the city. The average cost of tree removal in Atlanta is $880, but most homeowners pay between $735 and $1,025. If you live on the outskirts of the city, you may need to pay more in travel costs. Keep in mind that tree removal does not include limb chipping or log splitting, which you may decide is necessary for your property. Fallen tree removal will be much cheaper and come in around $100. When old trees are removed, even professionally, the stump typically gets left behind. The average cost of grinding a large tree stump in Atlanta is approximately $136. If you have a very small stump that needs to be ground, there many be a minimum fee, which is usually upwards of $50. Stump removal will cost more, around $400 to $450, as it will take long to completely uproot the stump and haul it away. For basic tree maintenance services that includes things like trimming, pruning and cutting, costs in Atlanta run an average of $376 per project. Price typically rises for trees over 30 feet in height because of the risk involved. These are just a few of the most common tree maintenance services and their costs in Atlanta. Remember that every neighborhood or property may have slightly different costs involved. The average range in price that a homeowner could pay is between $310 and $442. Although Atlanta is often thought of as an urban environment with more skyscrapers than open green spaces, it does actually have a number of beautifully forested areas. Whether you want to grow new fruit trees or cut down unsightly old pine trees, here are some of the most helpful tips for the city. Before residents and homeowners within the city of Atlanta can remove trees, they need to check city regulations. Even on your own property, any hardwoods with a diameter of six inches or larger need a permit, and pines with a diameter of more than 12 inches require the same. This rule is because of the Tree Protection Ordinance of the City of Atlanta, which states that there should be no net loss of trees within the city. If any trees on your property have the potential to affect power lines, the city will send out an arborist to determine whether the tree needs to be removed or trimmed for safety. Currently, however, there are no regulations about grow trees around power lines. Although tree removal can be done at any time of the year, January is often the best month in Atlanta. This is because there is less demand for tree maintenance in general, which will reduce the costs involved. In addition, January tree removal will have a smaller effect on your lawn overall. Atlanta has a humid subtropical climate characterized by hot and humid summers, mild winters with overnight freezing common and abundant rainfall. Many of the trees that do well in Atlanta are able to grow in the clay-like soil of the Piedmont region and can withstand the heat of the summer. The Atlanta Tree Commission (PDF) recommends planting native trees like maple, silverbell, blackgum, pine and poplar among others. For the most part, those trees that are most popular in the city are also the trees that are easiest to maintain. The bright red leaves of the trident maple (Acer buergerianum) is especially popular because of its color. Other popular trees in the Atlanta area include pines, yellow buckeye and the American holly. Trees Atlanta has a full list of the 50 most common trees in the city along with pictures. The best fruit trees to grow in Atlanta are those that can handle a hard freeze during the winter. Tropical fruits won’t do well, but apples, pears and peaches can thrive in this environment. The Champion Tree Project seeks out all of the tallest trees in the Atlanta area. Currently, the tallest tree in Atlanta is a tulip poplar found in Deepdene Park. 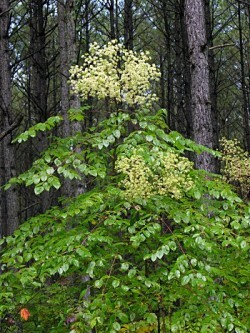 Some of the shorter trees that grow in Atlanta include the Devil’s walking stick (Aralia spinosa) and the paw paw (Asimina triloba). 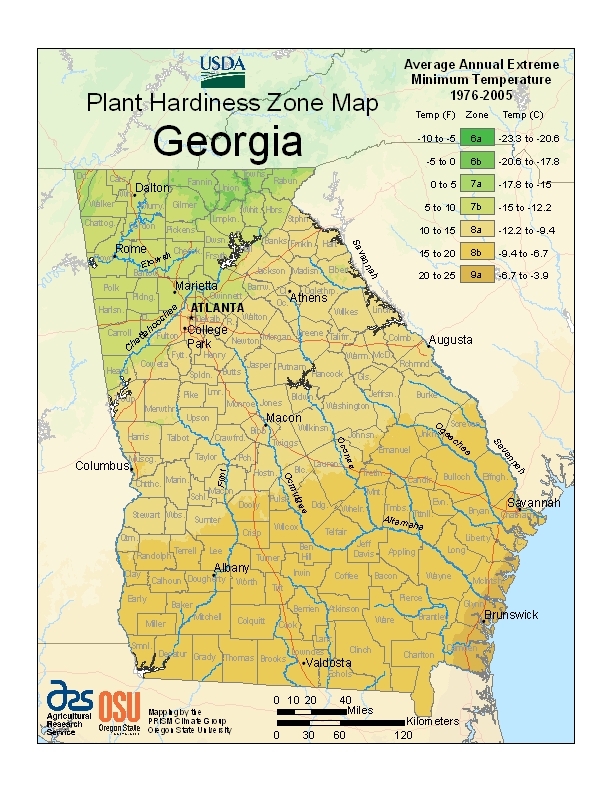 The abundant rain and moderate temperatures of Atlanta make it a prime place for many trees to grow, but some can be exceptionally difficult to maintain. Redwoods are the hardest to maintain as they need a lot of water on a regular basis as well as lots of space to expand. Although there are a handful of redwood trees in Atlanta, they are uncommon. The state tree of Georgia is the live oak. 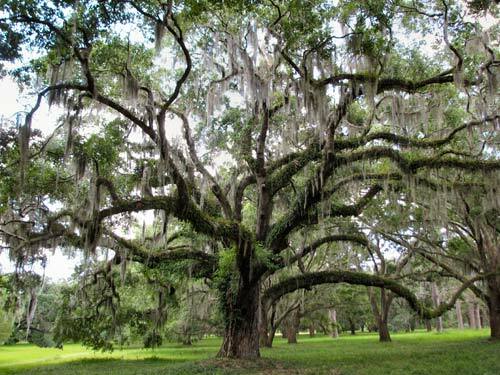 Although there are a number of different oak trees found in Atlanta, live oak is very rare. Live oak does best along the warmer coastal sections of the state rather than the capital city. Trees in Atlanta are not immune to disease. Some of the most common ailments are oak leaf blisters, anthracnose, tubakia leaf spot and bacterial wetwood. Arborists and tree maintenance specialists may be able to deal with these problems as they arise. 3. Assessment of standing trees for needed attention (trimming, disease, removal, etc).